NBA SBL annual conference sponsorship for young lawyers. 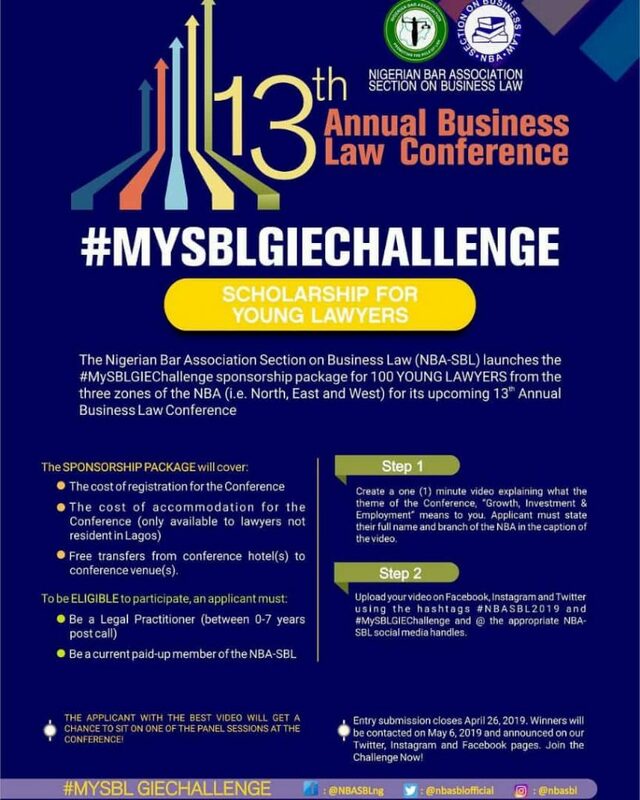 The Nigerian Bar Association Section Business Law launches the #MySBLGIEChallenge sponsorship package for 100 YOUNG LAWYERS from the three zones of the NBA (i.e. North, East and West) for its upcoming 13th Annual Business Law Conference. • Free transfers from conference hotel(s) to conference venue(s). 1.Create a One (1) minute video explaining what the theme of the Conference, “Growth, Investment & Employment” means to you. Applicant must state their full name and branch of the NBA in the caption of the video. 2. Upload your video on Facebook, Instagram and Twitter using the hashtags #NBASBL2019 and #MySBLGIEChallenge and @ the appropriate NBA-SBL social media handles. Entry submission closes April 26, 2019. Winners will be contacted on May 6, 2019 and announced on our Twitter, Instagram and Facebook pages. Join the Challenge Now! THE APPLICANT WITH THE BEST VIDEO WILL GET A CHANCE TO SIT ON ONE OF THE PANEL SESSIONS AT THE CONFERENCE! Details are on the flyer.